Yesterday was a happy day in Indore, India. kalmstrom.com Lead Developer Jayant Rimza married Sushma Likhar, and nearly a thousand guests celebrated the wedding. Peter, CEO of kalmstrom.com Business Solutions, was of course one of them. As you see above he was properly dressed in a beautiful kurta. 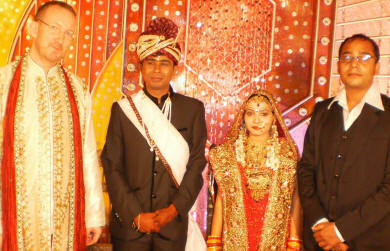 The photo shows Peter with the bride and groom and kalmstrom.com Senior Developer Abhishek Sharma. Abhishek has given us more photos, published at the kalmstrom.com Community page on Facebook. Welcome to have a look!